Hei, Hyvää uutta vuotta ja mukavaa loppiaissunnuntaita! Palaillaan pikkuhiljaa sorvin ääreen. Tervetuloa tammikuun Penny Black and More haasteen pariin. Ystävänpäivää kohti, teemana "rakkautta ilmassa"! Osallistua voit millä tahansa leimalla, mutta ei digikuvalla, muut ohjeet löytyvät blogista. Olemme taas saaneet hienot ja oikeat palkinnot, tulehan mukaan! Hello Happy New Year ! First Sunday of the month - it's time for new Penny Black and More Challenge. Our lovely theme is: Love is in the air! 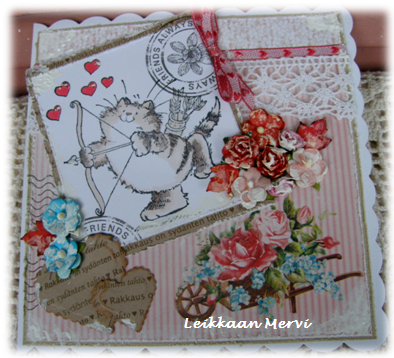 Valentine Day is soon, so show your stamped creations and be in a draw for fabulous prizes. Flowers WOC, SP leaves (sprayed with red mist); SP hearts die cuts. Really romantic card Mervi and the colours you have used give it a vintage feel. Upea kortti, kerrassaan ihana!! Hyvää Uutta Vuotta sinulle Mervi! Super cute card Mervi. Beautiful details and loving the stamp! Beautiful card Mervi. Love that sweet image and the pretty embellishments. Thanks for joining us at TG this week. Have a good and creative year 2013! Your new card is so beautiful!Love the cat and all the flowers! Oh this is so gorgeous love the image. 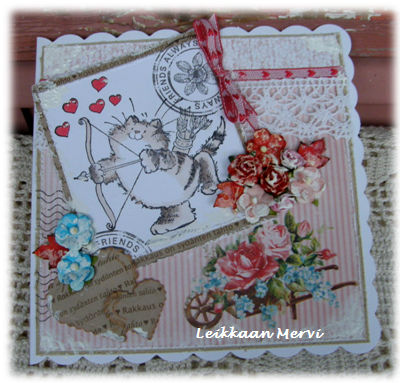 Stunning vintage card Mervi! The image, colours and embellishments are gorgeous. hi mervi, thank you so much for the gorgeous christmas card; wishing you all the best for the new year. this is very cute! 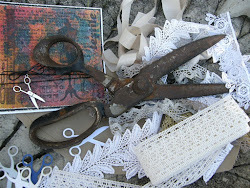 i love the flowers and lace and kraft hearts. This is a lovely card, great layout. Such a pretty little card, and that image is so cute. Thanks for joining in with our challenge this month.